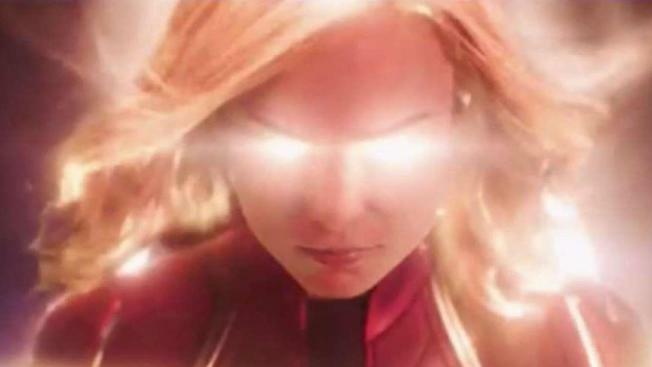 Marvel Studios dropped the official trailer for its anticipated film "Captain Marvel," set to hit theaters next year. Marvel fans can now take a first-look at the anticipated “Captain Marvel” superhero film. The full theatrical trailer debuted during the 70th Emmy Awards Monday night, and begins with cosmic hero Carol Danvers, portrayed by Brie Lawson, falling thousands of feet from the sky and crash-landing into a Blockbuster Video store. Seemingly dazed and confused, Danvers wanders around the city fully dressed in her Starforce uniform, before crossing paths with S.H.I.E.L.D. agent Nick Fury, played by Samuel L. Jackson. Fury tells Danvers that he was ready to hang it all up until met her. Through a series of intense flashbacks showing Danvers falling to the ground and rising back to her feet, she tries to piece together her connection to Earth, showing off her resilience and giving viewers a glimpse of her powers. Marvel posted the official trailer and movie poster on social media Tuesday morning, which features three words: higher, further and faster. “Captain Marvel” is set to hit theaters on March 8, 2019.